My godmother and great-great aunt, Lora Hawkins, was, according to family lore, the first woman to ever work for Southern Pacific Railroad. Jilted by her fiance, she never married and chose a career. She was reportedly an assistant ticket clerk and stenographer at the Lake Charles, Louisiana, depot, and I have the name plate that was on her desk. 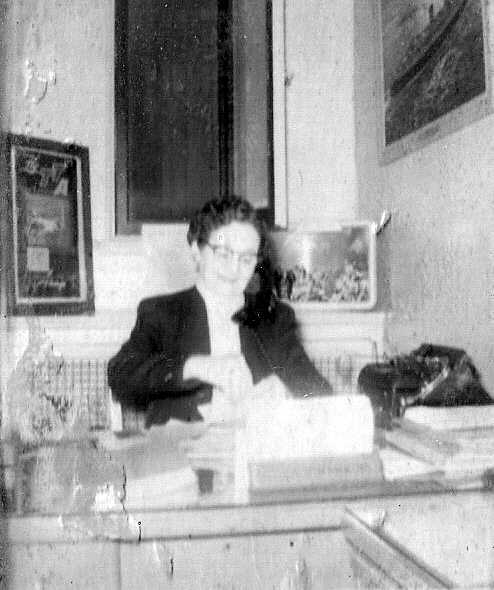 Newspaper photograph of Hawkins, the first female ticket agent in Lake Charles for the Southern Pacific railroad. That's an intriguing query, Ms. Cariker. What are her birth and death dates, please? The Southern Pacific and its immediate predecessor (and subsidiary) company, the Central Pacific, hired women sporadically though not consistently from the latter 19th century, sometimes when they were widowed by a man in either company's service that died in that service. The few female employees I am aware of were in California and typically worked as depot (or station) agents and telegraph operators – which assumes they had learned the complexities of Morse code. It wasn't until the mid-20th century that railroads – especially the fairly conservative and traditional-minded Southern Pacific Company – began to hire women as clericals for its district and headquarters offices. Even into the 1950s at SP's San Francisco headquarters, men outnumbered women in the many office jobs contained at One Market Street. 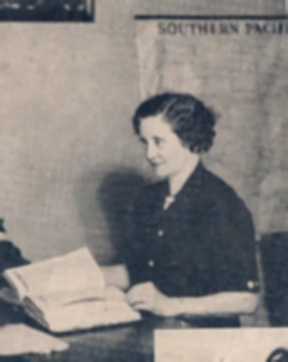 Had it not been for the rise of aggressive commercial enterprises like Heald's Business College, which were formed to educate young ladies on office support – stenography, typing and records-keeping, it is doubtful that American businesses and railroads would have begun to hire women. It was a very male-dominated business in all its aspects easily into the 1970s and 1980s. As for women in train service and railroad repair shops laborers, that wasn't even considered until World War II and came about thanks to the so-called "Rosie-the-Riveter" movement. In that period women did yeoman effort in the railroad shops and to a far lesser extent in certain urban railroad settings such as fare collectors on SP intercity electric trains serving the San Francisco Bay area and the Pacific Electric Railway, SP's subsidiary in the LA area. One of the problems you'll unfortunately encounter is a dearth of employee records; Railroad Retirement Board record-keeping doesn't begin until the early 20th century, and sadly few of these records for any railroad company have been preserved because of the sheer volume of record-keeping required. I'll leave it to someone else on this list with more experience with SP Texas Lines and SP Louisiana Lines operations and management to answer where any relevant personnel records might be. Best wishes for your continuing search! Can you direct me to the e-mail addresses of "real people" in the Lake Charles office, or in any office where I might uncover historical information about my aunt? The publication was black with white (now off-white) printing. To answer your question, Lora Mae/May Hawkins lived 15 September 1888 to June, 1983. Her Social Security Death Index benefits state "Civil: Railroad Board". Again, I appreciate any help as I try to learn more about this incredible lady. A list of Southern Pacific officers, agencies and stations that is dated March 1, 1879 indicates that Annie Feary was an agent at Tipton, California, so someone born in 1888 clearly would not be "the first woman to ever work for Southern Pacific Railroad" (Tipton is located in California's San Joaquin Valley). But there were almost certainly women employees on the SP before 1879. Hmmm... so I wonder if she was the first maybe in Lake Charles? In Louisiana?